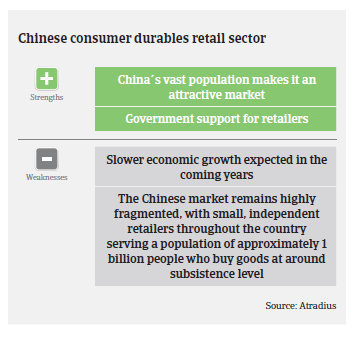 The current economic rebalancing efforts do not yet really support consumer durables retailing, as the saving rate of Chinese consumers remains high. 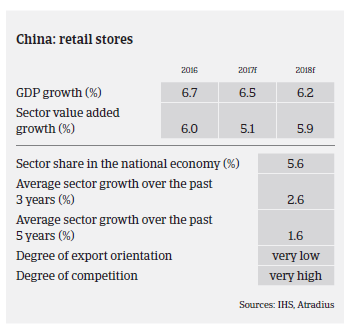 China's retail industry has recorded substantial growth rates for a couple of years, due to rising disposable income and booming urbanisation. However, since 2014/2015 the pace of consumer durables sales growth has slowed down, mainly due to lower economic growth and increased volatility in the property market, especially in third and fourth-tier cities. Sales of domestic appliances remained sluggish in H1 of 2016 but rebounded towards the end of the year, following the subsiding of inventory issues, especially for products such as air conditioners (up 33%), washing machines (up 10%) and refrigerators (up 7%). 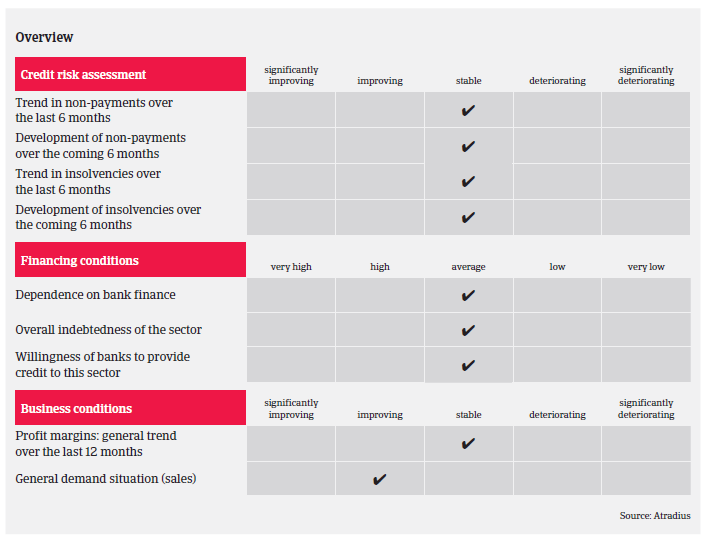 However, as this upturn is driven by replacement and upgrade demand, it is expected to remain temporary - sustaining into H1 of 2017 before abating again. The current economic rebalancing efforts in China (away from export-oriented investments to more consumption-led growth) could lead to higher growth rates in sales of consumer durables. However, so far the rebalancing efforts do not really support consumer durables retailing, as, due to the lack of a comprehensive social-safety net, the saving rate of Chinese consumers still remains high. Additionally, the Chinese government continues to focus mainly on infrastructure fixed asset investment (which increased 17.8% year-on-year in 2016), which will remain the key driver of economic growth in 2017. That said, in November 2016, the China State Council announced several supporting policies in order to enhance retailers’ business environment, including tax reductions and better access to bank lending for small and medium-sized retailers. While the output and total sales of consumer goods are barely growing, online retailing is rapidly expanding at the expense of brick-and-mortar businesses, with China about to become the world’s largest e-commerce market. According to the China Center for Information Industry Development (CCID), the market of B2C online shopping for home appliances (including mobile devices) amounted to RMB184.8 billion (EUR 25.3 billion) in H1 of 2016, an increase of 35% year-on-year. Online sales of flat TVs, air conditioners, refrigerators and washing machines increased by more than 40%. Sales of water heaters, exhaust hoods and built-in kitchen appliances even grew by more than 50%. On average, payments in the consumer durables retail industry take 60 days, and the number of notifications of payment delays is rather low. The majority of payment delay cases is usually caused by trade disputes, not by buyers´ financial problems. The sector’s default/insolvency rate is relatively low compared to other Chinese industries, and we do not expect this to change in 2017. Our underwriting stance remains generally open for the household appliances segment, as we expect sales to increase further in 2017, mainly driven by replacement demand and product upgrades. However, we closely monitor privately-owned consumer durables retailers who have diversified their business portfolios, and are exposed to high gearing. For such companies, investment failures and/or banks refusing loan renewals could lead to serious liquidity pressure. In order to mitigate margin pressure from higher raw material costs, industry leaders such as Midea and Gree have taken pre-emptive measures to lift product prices selectively, and we expect this to continue in 2017. However, the potential negative impacts from rising sales prices will be limited. Chinese consumers are less sensitive to minor price changes on big-ticket items such as large home appliances, and focus on comparing functionalities and value between the various brands.